I've been playing around with rhubarb again, mostly because its one of the few local produce items I can find around these parts. In time for the weekend (fingers crossed for good weather), here's a tasty cocktail that I've been working on. 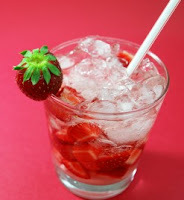 Cut up one of the strawberries, put in bottom of glass with the syrup and muddle. Add ice, then gin and top up with soda. Stir, then garnish with other berry on the rim. Simmer, stirring often, for 5 minutes. Rhubarb should be very soft, and have broken down. Press rhubarb with potato masher or similar gadget to release additional flavor into syrup. Cool, and press again. Strain out rhubarb. We served this one at an event last night, and it was quite popular. It's certainly not the most original drink ever invented, but it was very tasty indeed. My parents are here visiting (and helping us out at the distillery), and they brought this with them. What is it, you ask? Why it's Black Magic from The Netherlands. In a sippy cup. My parents have a friend/neighbor who is Dutch, and she had recently been home and brought a bottle of this stuff back with her. Unlike me, my parents aren't big drinkers, so they were excited to bring us this stuff that sounded interesting. They couldn't talk the neighbor into borrowing the bottle, so they poured some into this cup (not sure where they got the cup) and drove here to Chicago from Denver with it. The story that came with it was that it was like absinthe, only black in color. It's not, really, except for having a strong licorice taste. According to my handy website translator, it's actual name is Drop Shot, it's 20% alcohol and its intended for the "party people." It literally tastes like black jelly beans. Very sweet, very black licorice. That's about it. And they recommend it be served with cola, or in a layered shot with Sambuca. Oh my. Anyone else ever encountered this stuff? 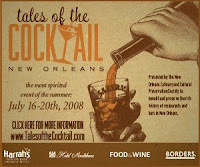 Have you already made your plans to attend the Tales of the Cocktail this summer in New Orleans? If you don't already know about it, its a 5-day festival celebrating the cocktail, chock full of interesting sessions, spirited dinners, and many opportunities to meet cocktail-world celebrities, compare notes, and share a cocktail with like-minded folks from around the world. I am happy to announce that I will be participating in the Tales Blog, a group blog where cocktail bloggers from around the world will be contributing pieces about their Tales experiences. As a preview to what you'll see at Tales, my fellow bloggers have already begun posting articles about some of the topics and speakers that you'll see at Tales. My first piece will be coming out in a few weeks. I'd highly recommend making your plans now for Tales, tickets often sell out and hotel rooms will be in short supply! And if you can't make it, you can attend virtually through the Tales of the Cocktail Blog. Its time for another Mixology Monday, and this month I'm actually going to get something posted before the deadline. Its been a little crazy lately, so unfortunately I have missed a couple of them! This month's theme is Rum and our host is Trader Tiki a/k/a Blair at Trader Tiki's Booze Blog (and check out the new MxMo logo at right!). Being a Tiki Drink fan, it seems perfectly logical that Blair would pick rum for the theme. And since spring has finally sprung, why not mix up a rum cocktail perfect for an afternoon BBQ on the deck? I must admit I don't spend much time with rum. Its not that I don't like rum, its just that there are so many other spirits to play with that rum hasn't been winning the battle for my kitchen counter and bar tools for awhile. I have, however, been playing with lemongrass (when I can find it - best bet is the produce markets on Devon Avenue) and tamarind lately. I was inspired by a bartender friend of mine who works at a Vietnamese restaurant. Muddle mint and lime with syrup. Add ice, rum and nectar. Fill with soda water and stir. Garnish with lemongrass stalk and sprig of mint. What, you don't have tamarind nectar? Leave it out and have a Lemongrass Mojito instead, also quite nice. The lemon & tea flavors of the lemongrass still come through, and provide some additional depth in the drink, without overpowering the key elements of mint, lime and rum. The tamarind spices it up alot, a little goes a long way with that one! And PS, this pic is from istockphoto.com. Unfortunately I left my camera at the office, and I wasn't about to miss another MxMo so I improvised the photo. Last month, I spent a few days in Indiana. Mostly, I was there on behalf of the distillery. However, in my free time, I went in search of a great cocktail. I had several good drinks, but a thoughtfully constructed cocktail was a bit harder to find than I anticipated (nothing wrong with being hopeful). My new friend, Bruce Tomlinson from World Wide Drinks, came to visit me at a tasting event and gave me the scoop on bars in Indianapolis (including the fact that he buys bitters by the case so that he can leave them behind at favorite bars, to ensure they'll be able to make his Manhattans properly). In fact, we checked out a couple of them one night. Sadly, no orange bitters were to be found anywhere that night. So we settled for what we could get and made the best of it. The best cocktail I had in Indiana was actually in downtown Lafayette at a new bar called The Black Sparrow. Full disclosure, I was there to sell them our products, and they decided to bring in a couple of them. Regardless, though, I was very impressed by what I saw there. This was a place I would hang out in, if it were closer to me (and that I will visit again when I am next in Lafayette). I had the Satan's Soulpatch, and it was a balanced blend of Old Overholt Rye, sweet and dry vermouth, grand marnier, orange juice and orange bitters. Really a modification of the Satan's Whiskers recipe, but a great drink. Their menu at that time also included a classic Corpse Reviver No. 2, Dark & Stormy and a variant of the Pisco Sour. It's already been updated for the season. Unfortunately, it was the middle of the day, and I still had work to do (and I wasn't in charge of the schedule). So I had to leave it at one drink and a sandwich, which was great too. But I'll be back. They had just hosted an event, and had some really incredible balloon sculptures in the bar - here's a picture of one of them, along with Johnny the bartender. I also found some promising cocktails at Farm in Bloomington (ask to see the root cellar if you get a chance), and a truly impressive Scotch collection at the Irish Lion Pub in Bloomington - both are worth a visit if you're in the area. It was a beautiful day to stroll around the downtown square, and I visited some used book stores, a great bakery and a fantastic chocolate shop. I guess the college towns are where the great cocktails are at in Indiana! Holy crap, the whole rest of April and the first few days of May got away from me before I finished my posting about the ADI conference. I better get this finished before a whole month has passed! Without further ado, here are the highlights from the last day of the conference - a very interesting day indeed. We left the Seelbach bright and early to head to the Huber Winery campus. Our sessions for the day were held in their lovely conference area. After the welcomes and administrivia, we kicked off the conference sessions with a panel of craft whiskey distillers. Relative to the "small batch" brands made by larger companies, their production levels are very small. However, they vary within their group - ranging from 1-2 barrels per month to 6 barrels per week being put away. Those who've been making whiskey longer, or have larger aspirations, are producing at higher levels. If they had it to do over, they all wished they had allocated more money for marketing. "Getting bottles to leave the store is the key," as Rick Wasmund rightly pointed out. I had the pleasure of leading a panel talking about working with partners in the distribution process. Our aim was to set realistic expectations among the new distillers (and those aspiring to be distillers) about how the process works, who the players are, and what you can expect. Since I was on the panel, I didn't get any photos of that one! We tried some interesting spirits. Each one was kind of a sucker punch - it was not what it tasted like blind. Nonetheless, certain folks in the room continued guessing (loudly) each time, sure that they new what each one was. That last one tasted like a well made, well-aged Scotch whiskey. It was smoky, with a bit of peat, very complex and smooth despite being 61.2% alcohol. Mr. Murray advised that it is made in Bangalore, and that at 5 years it is positively undrinkable. It is so hot there, that whiskey ages much faster than it ever would in Scotland. I'm sure the Scots are none too happy about this. After the formal conference ended for the day, we had an informal tasting of products. Most of them are either on the market or works in progress. Lots of interesting stuff to taste, most of which I can't get in Chicago. The most interesting thing I tried, which has never been on the market here as far as I know, is a Topinambur made by one of the finest distillers in the US. What is Topinambur, you ask? Its Jerusalem artichoke brandy, quite popular in a small part of Europe. The Jerusalem artichoke is also known as the sunchoke, and apparently has more sugar (fructose) in it than beets. I think this tops the white asparagus brandy that Derek tasted in Germany a few years ago, but maybe not. We had a fantastic fried chicken dinner at Huber, and then we headed back to the hotel. As you might expect, some of us went out afterward. It was kind of late by the time we headed out, though, and being a weeknight there weren't that many options. So we ended up in the touristy 4th Street Live area. Not much to say for the drinks (pretty much bourbon or beer), but it was fun. There is some great public art in Louisville - here are a few favorites.